DH and I shop at one of the big box club stores. The last time we went there, DH had a hankering for chicken wings. We bought a six-pack that consisted of 5 wings per pack, with a total of 30 whole wings. When we opened the individual packs, the wings were tiny in comparison to what we buy normally. The original packaging may have been marked that they were fryers, but I didn’t notice when I split the 6 packages apart initially. I defrosted 3 of the 6 packs, which DH cut into pieces, saving the flippers for MIL who uses them in soup for extra flavor. Our kitchen is efficient and perfect for two working in it at the same time. So while DH was butchering the wings, I was preparing my sauce for the wings. 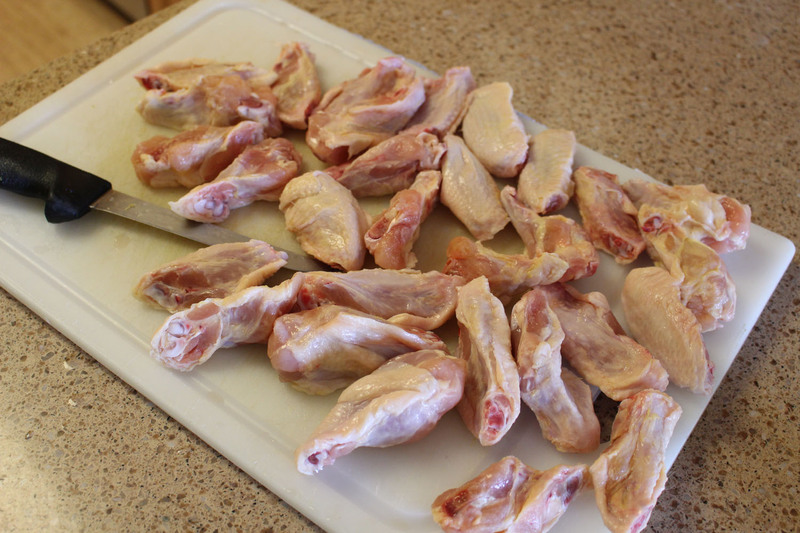 Use a sharp knife and cut the wings down into 3 pieces at the joints. (I discard the wing tip section or flipper). Add ketchup, preserves, brown sugar, Worcestershire sauce, and vinegar to a sauce pan. Cook for 10 minutes on low stirring frequently. Take the little glass or plastic knob out of the lid of the blender. Place sauce in blender with lid on. Cover hole in lid with a cloth hand towel bunched up so steam escaping won’t burn your hand. Blend sauce until smooth for 1-2 minutes, set aside. Use non-stick foil and line a jelly roll pan which is similar to a cookie sheet with sides. 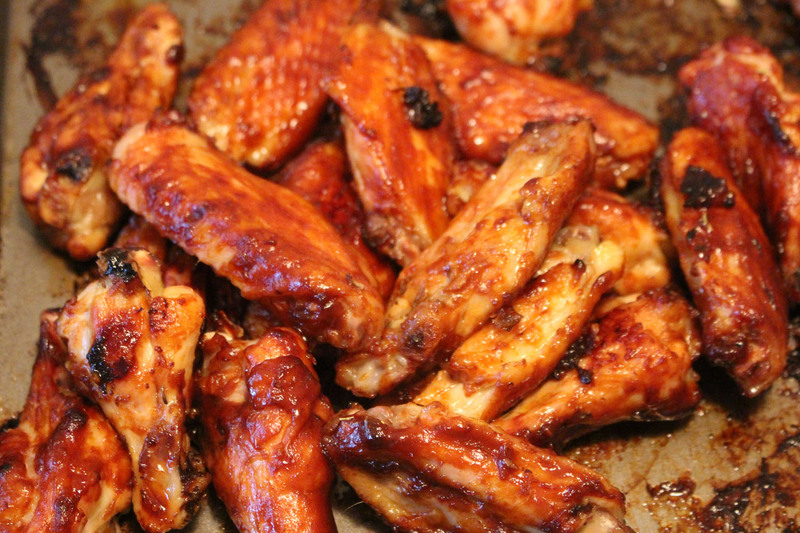 Place chicken wings skin side down, spray with cooking spray, and bake for 20 minutes. Turn wing pieces over with skin side up, and bake for additional 30 minutes. Microwave sauce for 1 minute, stir. Place wings in a bowl and toss with sauce. Place wings back on pan with skin side down and broil about 10″ away from heat for 5 minutes (I place the wings on a middle high rack instead of the highest rack). Turn wings over with skin side up and broil An additional 5 minutes. that sauce looks yummy! we have a different store across the river here & i buy 10lb bags of IQF wings. I usually cook them all up with several sauces. I think I’ll make yours next time!